Here are the proto-beginnings of the Marvel Universe. 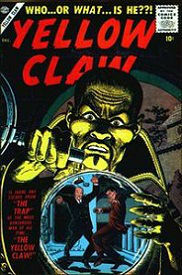 The Golden Age is sort of a prequel to the official Marvel Universe. The comics were very simple, and the concept of a shared universe wasn't really there yet. Which isn't to say there aren't a few interesting cross-overs. It was semi-officially established in the 1970s that a Golden Age comic only counted as being in continuity if it was referenced in a modern era book in some way, so we're on tenuous ground with a lot of this stuff. But generally speaking, the events of the Golden Age definitely "happened" in the Marvel Universe even if some of the details have been revised. So it's an interesting look. I should note that thanks to the sporadic and random nature of reprints, my collection doesn't cover the complete era (although i think it's representative) and i've also had to play looser with the order of books relative to their publication date, although since continuity is minimal/non-existent, that really isn't a problem. You may also want to check the pre-Fantastic Four #1 section of the What's Missing page one the left sidebar as there are a decent number of moderately significant Golden Age characters that are not included in my collection. Creator notes: This time period was apparently very appealing to subsequent writers, so nearly half of the comics in my collection are continuity implants, from Stan Lee's Sgt. Fury in the 60s to Roy Thomas' Invaders in the 70s and Mark Waid's Captain America: Sentinel of Libery and Roger Stern's Marvel Universe in the 90s, and even Ed Brubaker's The Marvels Project in 2010. Which is good, because the actual comics from the Golden Age start off cute, but they get pretty hard to slog through after a while. 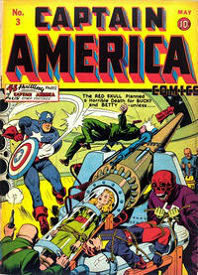 Of the original stories, Bill Everett, Carl Burgos, and Joe Simon & Jack Kirby are the top creators. In many cases the credits are lost to time. Magazine publisher Martin Goodman, the publisher of Timely Comics, later Atlas, later Marvel, also hired his nephew Stanley Lieber to help out, and he soon began writing books as Stan Lee. Notable events: Aside from the significant characters that are introduced, there's two notable cross-overs that already suggest the beginnings of a shared universe: Marvel Mystery Comics #8-10, which features a major battle between the Human Torch and Namor, and Human Torch #5A, which includes a number of Timely's heroes in a single story. Cross-overs like that were a rarity, however, and there wasn't really any sense of shared "continuity" at this point. New characters: Captain America, Bucky, the Red Skull, Sub-Mariner, the android Human Torch, Toro, Golden Age Angel, Golden Age Vision, the Destroyer, Hurricane, Citizen V, Lady Dorma, Professor Horton, Princess Fen, Namora, Yellow Claw, Jimmy Woo, Venus, Marvel Boy, Gorilla Man, and many more. 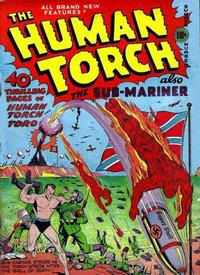 Marvel Mystery Comics #8-10 First Marvel crossover: the GA Human Torch and the Sub-Mariner fight! Invaders #7-9 Formation of the Invaders. Sgt. Fury and his Howling Commandos #27 1st Eric Koening. Nick Fury's eye injured.